Ryan and I have been friends for more than fifteen years, through all sorts of evolutions, of which my becoming a pilot is only one of the latest. We've both been through a lot and are quite different people now, living quite different lives, than when we first met in college. One thing that we've always shared, though, is an interest in anything motorized. When I had the opportunity to get a few tickets to the Indy 500 on Memorial Day weekend, I knew who to call. "Man-cation." That's what Ryan called the plan we sketched together over the last six weeks. It was ambitious, but it worked out pretty much as planned, beginning with his arrival by airline into DC and a subway ride to the stop near our house on Thursday night. He helped pack and make final arrangements while I did some work on Friday morning, then we headed to the airport and took off toward the west. In the week leading up to our trip, the forecast had been gloomy for the entire time we planned to be traveling. I warned Ryan that "no-go" decisions could be made for any leg of our trip, but the warning wasn't needed for the start of our trip. We had beautiful, smooth air as we headed across the mountains of Virginia and West Virginia. We flew out from under the overcast layer as we crossed into Ohio. Flying low over a lake, we caught sight of the airport (I10) and circled for a landing to the southwest. We were higher than a normal traffic pattern because we hadn't seen the airport until late. If there's one thing I know how to do with the Tiger, though, it's how to make it come DOWN. Full flaps, power off, a hard slip, and we circled down for a smooth landing. There was no taxiway, but there were tie-downs in the grass alongside the runway. 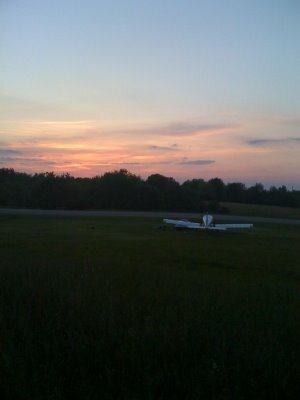 We taxied onto the grass, parked, and shut down the engine. There was only silence. The airport was unattended -- not even a trash can, as we would later learn. We unpacked the plane and set up our tent in time to enjoy the sunset. We carried our cooking supplies through the woods and set up our camp kitchen by the water of the lake. We didn't let the "NO SWIMMING" sign ruin out mood ("Signs, signs, everywhere signs, [mess]ing up the scenery, breaking my mind....") and instead just cooked our steak kebabs, hot dogs, and beans on a camp stove next to a small fire. It was a great evening and a perfect opportunity for a couple of old friends to catch up on each other. The only fly in the ointment was that it was a 15-minute walk, round trip, back to the plane, and we had forgotten numerous small but essential items. My memory is fuzzy, but I may have walked that trip at least fifteen times for silverware, propane, a knife, etc., etc., etc. We slept well, next to the plane, and in the morning prepared breakfast at our make-shift kitchen. After our breakfast, heavy on protein, we packed up the plane and took off into a gentle morning sky. With the canopy open, we kept our airspeed slow and flew west only a thousand feet above the rolling hills of Ohio. It was beautiful, so I said it: "Ohio's beautiful!" In unison, we both said, "Who knew?" Ohio might be one of the best kept secrets of our broad country. This year's crops have started to come up, but the plants are only inches high, so the fields appear from the sky to be only dirt. Moisture in the soil creates a dappling effect in the sunshine. Ryan compared the visual effect to the coat of a hyena. 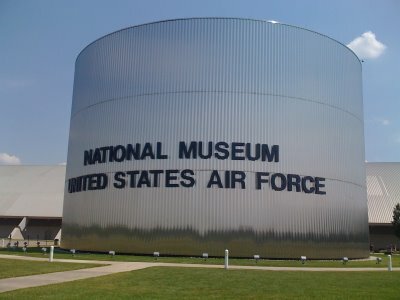 We landed at a small airport south of Wright-Patterson Air Force Base and picked up an inexpensive rental car for a short drive to one of the must-see destinations for aviation buffs. We had only a half day, but we did the best we could and saw hundreds of cool and/or historic airplanes. I had seen the Enola Gay, the airplane that dropped the bomb on Hiroshima, at the Smithsonian Air & Space Museum Annex. I didn't even know the name of it's "sister" ship, Bockscar, that dropped a similar bomb on Nagasaki. The museum closed before we had our fill, which means we'll have to go back sometime. 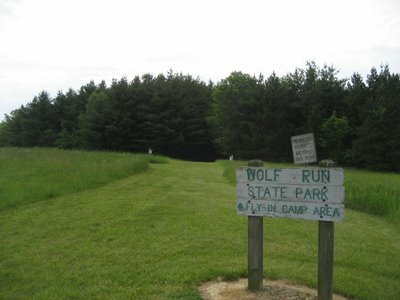 With several hours before dark, and time to kill, we headed to nearby sacred ground. For a place so significant to the history of aviation, where the Wright brothers first perfected controlled flight, Huffman Prairie was a bit underwhelming. Everyone knows about Kitty Hawk, where they first achieved powered flight. It was at Huffman Prairie, however, that they figured out how to make an airplane controllable. I guess it can only be what it is -- a big field with nothing to crash into. We stopped for groceries after Huffman Prairie and took off toward the settling sun for a short flight southwest. Passing west of Cincinnati, we followed the wide Ohio River downstream. Banking right, over the boundary into Indiana, we circled a low ridge and landed at a grass strip known as Lee Bottom Airport. We were greeted by Rich and Ginger Davidson, who own and operate Lee Bottom. Both avid pilots, they run the airport purely as a labor of love, with only a tip jar on the porch to help defray costs. Their website actually mentions that the airport takes half of their incomes to maintain. 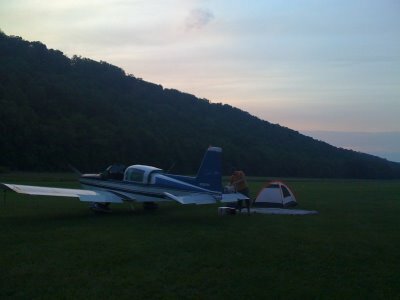 The quality of the turf runway was top notch, and it was a beautiful place to camp. With their uber-friendly cat assisting (or interfering, depending on your perspective), we pitched our tents and set up our camp stove on a picnic table. Rich and Ginger came out and we talked of all things aviation until the small hours of the morning before going to bed. We awoke to a thick fog that screened nearby hills from view. We weren't in any rush to leave, which was a good thing because the visibility wasn't good enough to fly. We made breakfast as the fog cleared, then packed the plane with our tent and equipment. After saying goodbye to Rich and Ginger, we taxied to the end of the runway, performed a runup check, and accelerated down the runway. We lifted off as I waved a final goodbye. A short while later, we were given vectors by air traffic control to fly over the approach end of Runway 5 Right at Indianapolis International. A few miles later and we dodged banner-towing planes to enter the traffic pattern at Eagle Creek Airport in Indianapolis. After two wonderful days of traveling, camping, and site-seeing, we had arrived in Indianapolis for our ultimate destination: the Indy 500! A taxi dropped our bags at the hotel, then we made our way to the Brickyard to see the race. The cars flew by our seats at over 220 mph, faster than my airplane! It must be frustrating to go that fast and not be able to get off the ground! Oh, the futility! There was a fantastic crash right in front of our seats, but fortunately there were no serious injuries. We wandered around the track after the race with my friend (and old flight instructor) Rich and his friend, Jake, then headed off to find dinner. The next morning, Ryan left for an airline flight back to Boston -- a motorcycle track was waiting for him and his bike. Rich and I headed for the Tiger to fly back home. A large storm system was covering the southern half of the eastern United States, however, and thunderstorms were forming and dissipating all around Indianapolis. We waited, went for lunch, watched the weather. We considered departing IFR, but with embedded thunderstorms popping up all over, we preferred to be in control of our flight path. In the end, we decided to stay VFR and head for an airport 40 miles northwest of Indianapolis. That wasn't the direction we needed to go, but by hopping from airport to airport, we zig-zagged our way around rain showers until we were north of the storm system, then skirted the edge of it as we headed east. After landing in West Virginia for fuel, we ducked back under the overcast and crossed the mountains for an uneventful landing back in Gaithersburg. This was one epic vacation, or man-cation, and I won't soon forget it. Hanging and reconnecting with Ryan was priceless, and the trip back with Rich was a successful effort at weather navigation. This is just so you don't ever feel bad about owning it and enjoying it. Hurray fer being blessed!